#ChedengPH is expected to make landfall over eastern coast of Davao Occidental. At 4:00 a.m., it was spotted at 105 km East of General Santos City. With winds up to 45 kph, gustiness of up to 60 kph, while moving west southwest at 15 kph. Rains with gusty winds preavail in Davao Region and SOCCKSARGEN. Cloudy skies with scattered to widespread rains affecting Visayas and Mindanao. Meanwhile, Metro Manila and the rest of Luzon will have partly cloudy to cloudy skies with isolated rain showers. 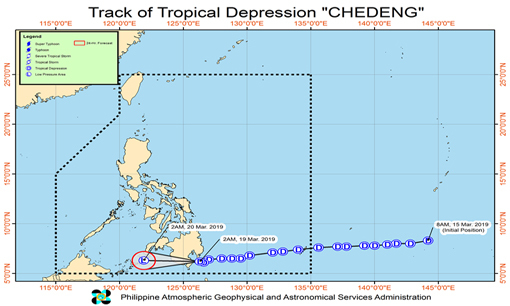 Tropical Depression #ChedengPH was last spotted 650 km East Davao City.